Home »Posts Tagged "Coffee Break"
There is strong evidence that regular breaks of 6 minutes help employees to boost productivity and control stress and tension. Instead of clogging your brain and body in times you are feeling overwhelmed, try to bring some inward peace. 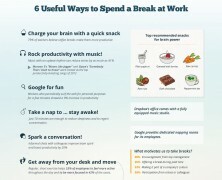 Find 6 ways to spend a break.